Three-Body Technology presents its 3rd product: Raindrop & Blade. A traditional Chinese instrument called Yangqin, based on Chinese hammered dulcimer. 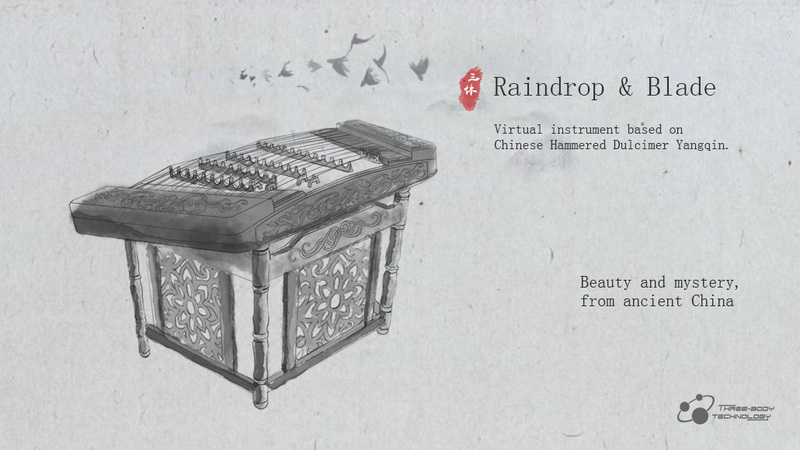 With the concept "not only capture the sound of the instrument, but also present the feeling of ancient China", Raindrop & Blade will bring you the beauty and mystery right into your studio, rather than experiencing it from some books or TV shows about ancient China. Completely self-developed, high-performance sample engine ensures better sound quality, with effects from H7S and 108 MIDI patterns made by professional Chinese Yangqi musicians, make it easy to create the sound like raindrop, without losing its intense feeling. Check the video below to hear it for yourself! Now available for $149. Completely self-developed, high performance sample engine: better sound quality, faster DFD (direct from disk) Stream, optimized samples compression and new tone transition technology. Through optimized samples compression, all 6,208 samples only require 2.9G disk space. 5 layers of velocity: The STBT (smooth transition between tones) technology brings more natural sound and captures perfect performance details. No matter how hard or soft you hit the keys, you can always get the sound effects that satisfy you. Separately recorded left-hand right-hand samples: the tone is different. Three modes are provided for Hand Exchange on the software interface to make the instrument played in a natural way. 3-5 RR (round robin) samples: the same pitch being played repeatedly is common in Yangqin. We recorded 3-5 RR for every velocity. Tremolo: two velocity layers of tremolo samples are recorded. We also recorded samples for octave- and third-playing tremolo. Clean Mode: inspired by the psychological sound model, we developed clean mode that decays differently for harmonic and non-harmonic tones. This allows sound to be cleaner than a real-world Yangqin. Common performances: tremolo, flicking, hammer revert, muting, and noises, etc. Two types of recorded release samples: by hand or by pedal. Yin-Yang Button: you can transit between polar contrast feelings by this button. From the Heavier7Strings' effect rack: Compressor, EQ, Chorus and Ping-Pong delay are included, allowing to create more flexible sounds. About 2 years ago, we started to record the convolution reverb samples from spectacular places, famous natural and historical heritages in China. Thus you can simulate Raindrop & Blade being played at the Great Wall or Terracotta Army site. Actual sample recording for near and mid-field. Simulated far-field via reverb. Adjustable parameters (sound field ratio, width) provides diverse tones for different genres from traditional to pop. Complete pattern library, manage your works and ideas easily. Rich preset patterns with updates in the future. Drag MIDI patterns into the host. Various preset from traditional to experimental.